Architectural styles, simply put, are a set of features that make a building easily recognizable. A style may include building materials and even method of construction. The history of architectural styles shows that design trends change according to every period’s beliefs, ideologies, and of course, existing technology. While architecture continues to grow and change, pre-existing styles are still prominent. They can be seen across the globe from buildings and mosques to museums and art galleries. Used to reflect society in the past centuries, architectural styles now are an artistic and expressive means. Major Metropolitan cities boast a range of styles that give them an impressive feel. From the Ancient Greeks to contemporary architecture, we bring you a brief history of 8 architectural styles from around the world. Modern Architecture first emerged in the first half of the 20th century. It relied on the use of new technologies available, using mainly glass, steel, and reinforced concrete. Modernism also emerged as a way to reject older architectural styles such as Neo-classicism. Modern Architecture usually includes plain geometric forms. It also emphasizes the location and function of the structure. Contemporary Architecture is otherwise known as the architecture of the 21st century. Architects employ various different styles in buildings rather than rely on just one style. 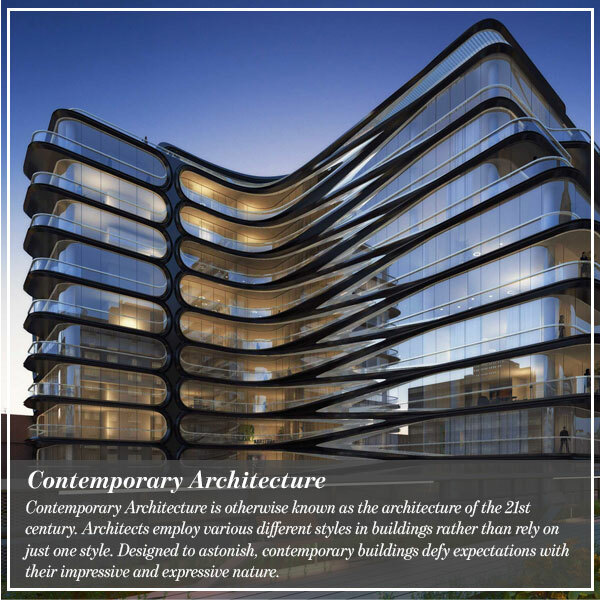 Designed to astonish, contemporary buildings defy expectations with their impressive and expressive nature. 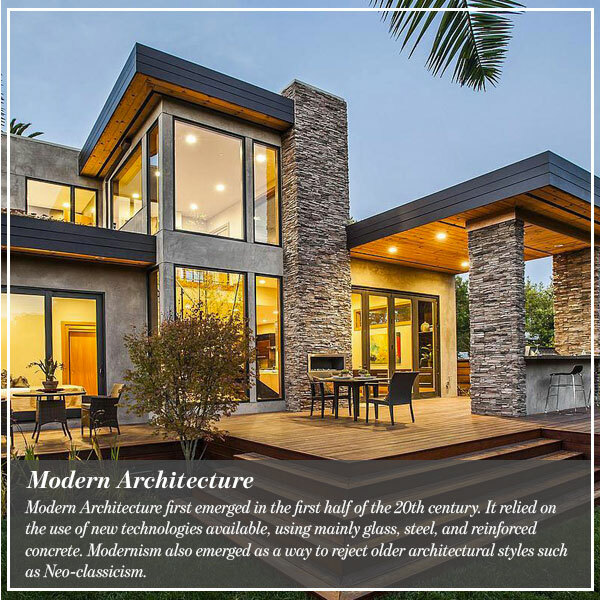 Contemporary Architecture sees the use of larger windows, curved lines, and of course, environmentally friendly material and design. 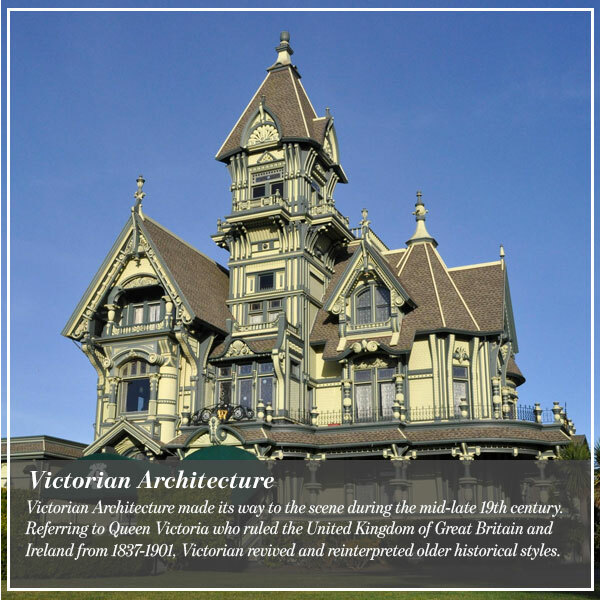 Victorian Architecture made its way to the scene during the mid-late 19th century. Referring to Queen Victoria who ruled the United Kingdom of Great Britain and Ireland from 1837-1901, Victorian revived and reinterpreted older historical styles. It also saw an introduction of Middle Eastern and Asian influences in design. Victorian style homes are narrow, tall, and asymmetrical. They feature stairs, towers, and a decorative trim on the exterior. Influenced by Roman, Byzantine, Chinese, and even Indian styles, Islamic Architecture was born in the 7th century. 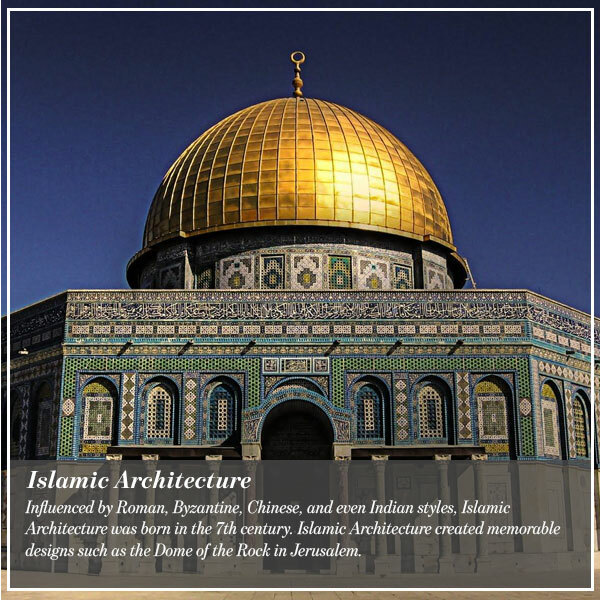 Islamic Architecture created memorable designs such as the Dome of the Rock in Jerusalem. It includes four main types: the mosque, the tomb, the palace, and the fort. Easy to spot, Islamic Architecture usually includes arches, tile designs, and towers. It also features the use of indoor garden areas. 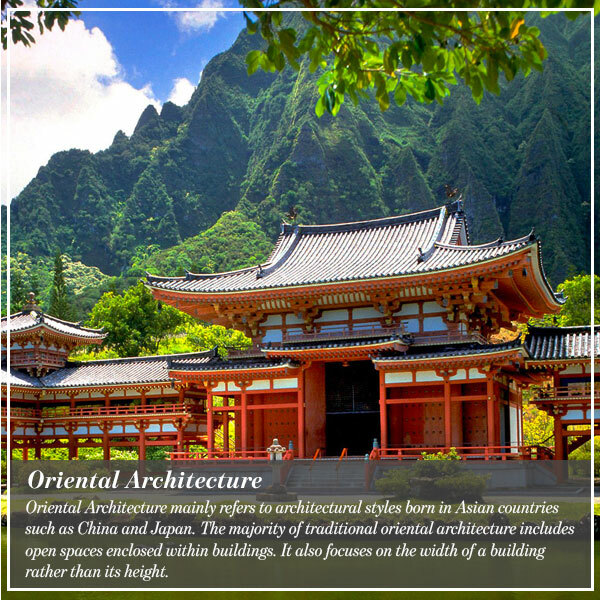 Oriental Architecture mainly refers to architectural styles born in Asian countries such as China and Japan. The majority of traditional oriental architecture includes open spaces enclosed within buildings. It also focuses on the width of a building rather than its height. Ancient Chinese Architecture boasted the use of wood, as well columns and beams. The structures were elegant and simple in appearance and were also flexible. 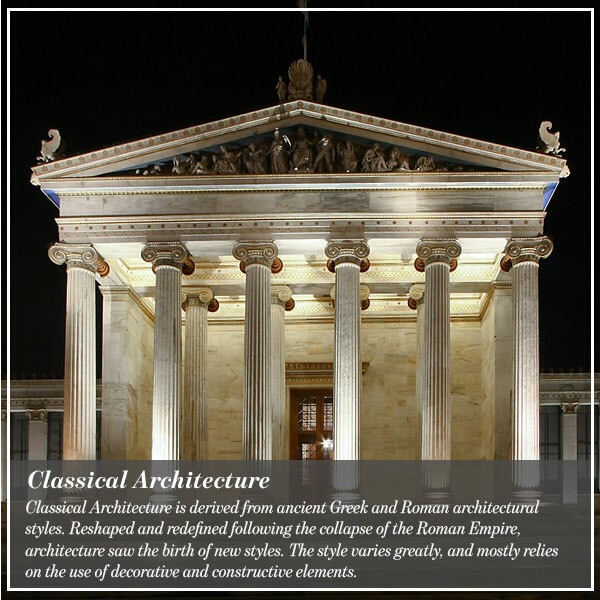 Classical Architecture is derived from ancient Greek and Roman architectural styles. Reshaped and redefined following the collapse of the Roman Empire, architecture saw the birth of new styles. The style varies greatly, and mostly relies on the use of decorative and constructive elements. The earliest and purest form of Classical Architecture is known as the temple. This is an oblong structure surrounded by columns. In the mid 18th century, the neoclassical movement brought about the birth of Neoclassical Architecture. At its core, this architectural style attempts to reinstate some characteristics of Ancient Greek and Roman architecture. 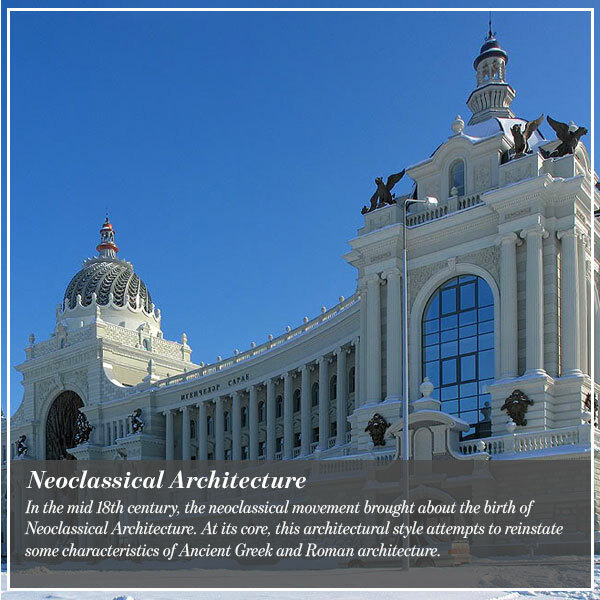 Neoclassical Architecture boasts several key features. They are mainly the use of simple geometric forms, columns, and also blank walls. Short for Arts Décoratifs, Art Deco gained popularity in the 1920’s and 1930’s. Art Deco combined modernist styles with rich materials and also excellent craftsmanship. Not limited to only buildings, this architectural style swept across furniture, jewelry, fashion, even cars, and trains. 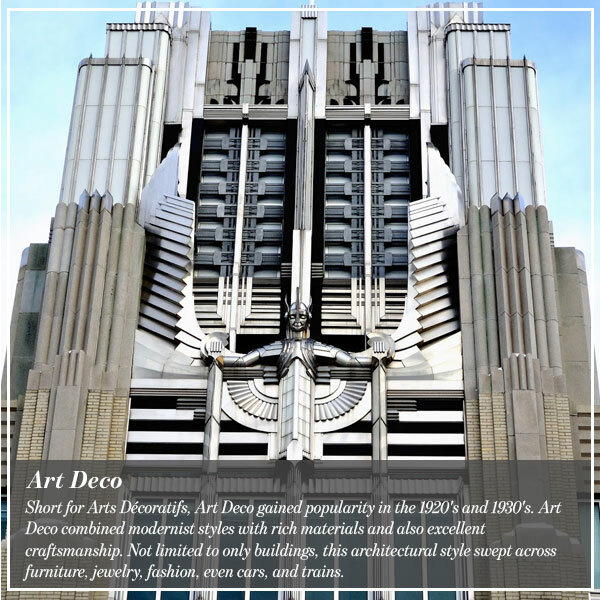 Art Deco largely aims to present a monolithic appearance. With the use of arranged geometric forms broken up by ornamental curves, it creates an artistic vision.